If you have access to palm fronds, use them to add a decorative touch to your home. They are the perfect accent to add to the ambiance of the beach and seaside in a tropical decor. You may be surprised at all the ways you can use palm fronds to decorate. Create a thatched umbrella. Buy an inexpensive outdoor umbrella for your patio, then use hot glue to cover it with palm fronds for a tropical look. 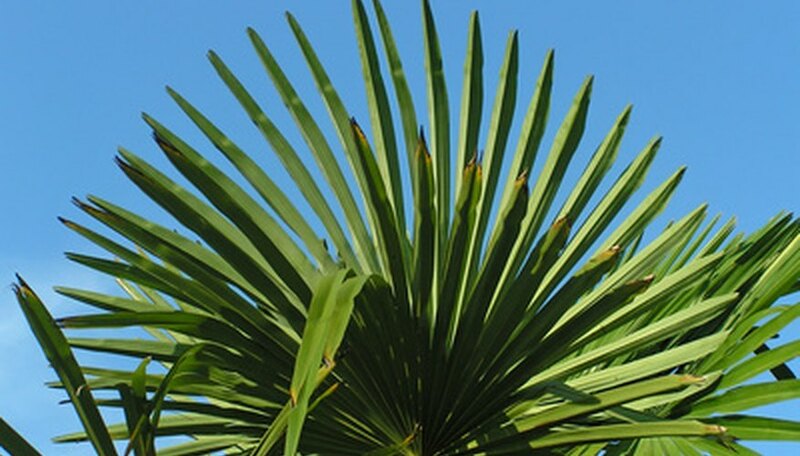 You will need quite a few fronds for this project. Place some fronds upright in a tall vase, similar to using bamboo sticks or branches from trees. This brings a bit of the outdoors into your home. Add a bit of water at the bottom to keep the fronds green as long as possible. Create a wreath by cutting the fronds and organizing them in a circular pattern. Use hot glue to create a fan shape, using the longest leaves in the back and the shortest ones on the front. Run florist’s wire through the back of the wreath and make a loop to hang it. Add a seashell, starfish or other tropical-themed object to the center. Allow a palm frond to dry and frame it for an interesting piece of artwork. Alternatively, take a close-up picture of a palm frond with black-and-white film and place the photograph in a wooden frame.